I am not one who usually participates in ’10 best lists’ as I always have at least 10 I want to be in the #1 spot whether it be best authors, best movies, best singers, etc., but there are 2 exceptions the first being best musical play and hands down it is “A Chorus Line” unless you make the list ‘Best Broadway play’ and then ACL has to contend with “A Streetcar Named Desire”, “Who’s Afraid of Virginia Woolfe” and at least 6 others! 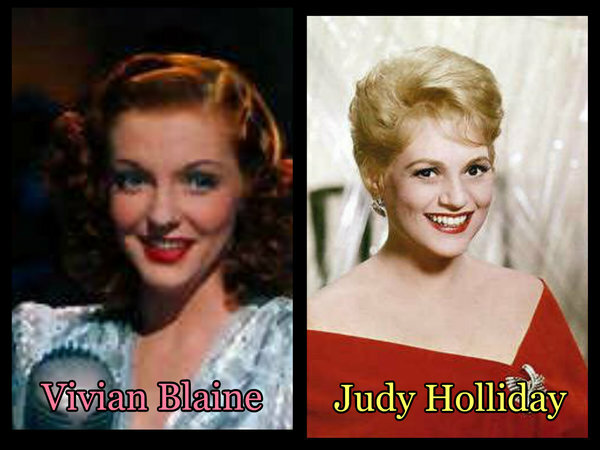 The other exception would be to list the funniest performers/performances you have ever seen on Broadway and the best in a musical would be Vivian Blaine as Adelaide in “Guys & Dolls” while the best in a play would be Judy Holliday as Billie Dawn in “Born Yesterday”! I couldn’t find a video of them on stage doing their roles but came close with Blaine doing “Adelaide’s Lament” at the Tonys. In a rare instance both recreated their roles in the movies so at least we have that to watch and get an idea of what they originally created on stage! Also known as “A Person Can Develop A Cough” Vivian Blaine stopped the show cold every performance with “Adelaide’s Lament”. When “Guys & Dolls” was made into a movie she was the only performer from the original Broadway cast to repeat their role. Aside from “Guys and Dolls” Blaine had a contract with 20th Century-Fox and made movies playing supporting roles. Judy Holliday lit up Broadway and Hollywood with her performances. Aside from her talent as an actress, comedienne and singer she had a very high IQ and it was sort of ironic she was mostly cast as the ‘dumb blonde’, playing them as if she was one in real life. Sadly she died too young at the age of 43 having breast cancer. I saw her in her 5 performances on Broadway and her performances remain in my mind to this day.